The first cabooses, not unlike the nautical originals, were wooden shanties built on flatcars, as early as the 1830s. 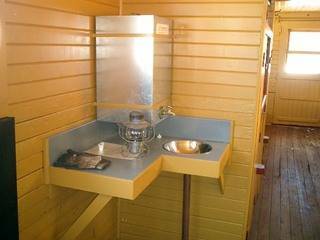 The railroad historian David L. Joslyn, a retired Southern Pacific Railroad draftsman, has connected caboose to kabhuis, a Middle Dutch word referring to the compartment on a sailing ship's main deck in which meals were prepared. Kabhuis is believed to have entered the Dutch language circa 1747 as a derivation of the obsolete Low German word kabhuse, which also described "wooden cabin" erected on a ship's main deck. However, further research indicates that this relationship was more indirect than that described by Joslyn. Eighteenth century French naval records make reference to a cambose or camboose, which term described the food preparation cabin on a ship's main deck, as well as the range within. The latter sense apparently entered American naval terminology around time of the construction of the USS Constitution, whose wood-burning food preparation stove is officially referred to as the camboose. These nautical usages are now obsolete: camboose and kabhuis became the galley when meal preparation was moved below deck, camboose the stove became the galley range, and kabhuis the cookshack morphed into kombuis, which means kitchen in Afrikaans. 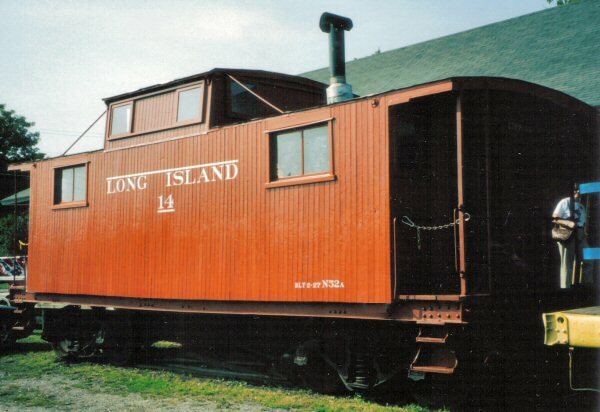 The Pennsylvania Railroad and LIRR officially referred to cabooses as "cabin cars". 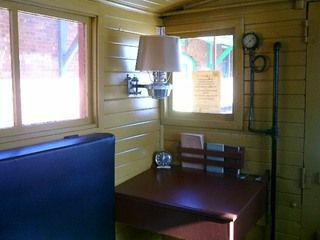 LIRR hacks were used as a freight conductor’s office even with their own desk built into the wall to do their paperwork. The desk was even illuminated by a wall-mounted kerosene lamp in some cases. These desks and lamps were still in place in some hacks as late as the mid-1970s. Cabooses, in general, were used as bunk houses for the crew which usually consisted of the freight conductor and two freight brakemen. 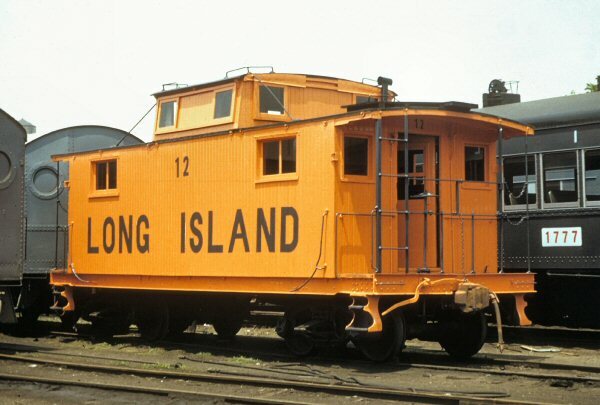 As the LIRR was a short-distance road, unlike the Pennsy which had freights that could’ve run overnight, they may have had no need to use their bunks and they may even have been removed over the years and used for storage, but originally the intent of the bunks was for crews to rest. LIRR hacks were used to cook meals and were quite good. Personally, I never had a meal cooked on a pot belly stove. Of course in later years, the cooking ceased in the cars, but they did at one time cook meals. This cooking was done over the coal fired, cast-iron stove that was located in each of the older hacks. 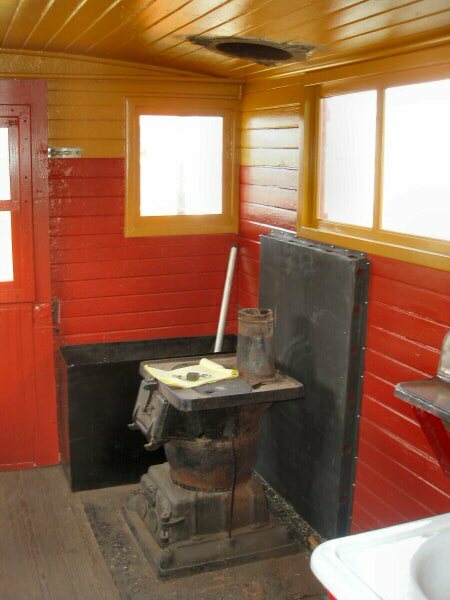 Contrary to some belief, those stoves were not installed specifically for heat, although they did provide heat for the car while the hack was not connected to the train during switching and while in the yard prior to a run. As you can see, this is a stove with large, flat cooking surface on top and not a stove that was provided solely for heating. Also notice the cast-iron back stop to keep spatter as well as grease fires from scorching the walls of the hack. The steel hacks were equipped by the crews with Coleman Gasoline stoves which were quite reliable. It was usually the flagman's job to prepare the meals. Concerning the crew consist; two brakemen were used on most MA trains and three were required on any MA job where a cross over move was part of their regular routine; think Corona or Glendale. Jobs out of Holban headed east also carried that extra brakeman who worked as flagman. 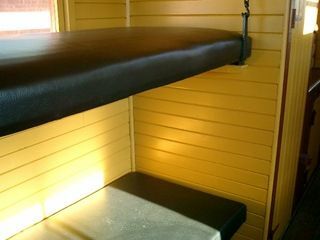 In the earliest days the bunks were indeed used for overnights at the end of the line. As time progressed, the crews on both freight and passenger consists that laid over in Greenport were given room and board "chits" and went up the street to one of the hotels or rooming houses for the night. Then there were the individual conductors who "owned" their hack. Stories go that one conductor had to have his caboose turned on the Greenport turntable ASAP after arrival. The car was then shoved out onto the end of the long railroad dock for the evening. He was an avid fisherman and spent the time fishing off the dock and preparing a mess of fish for the next days trip west. In the summer the cool bay breezes kept his hack cool on the hottest of nights and during WWII, when the Coast Guard patrol boats would tie up for the night, they would throw him an electric line from the boat so he could have electric light to read and cook by. To a protective conductor, his hack was his home and he did everything he could to delay the car going into the shops for a big overhaul. They hated to give up their home for an annual cleaning and paint job! Then there was the part Native American Brakie who shot fresh dinner meat as the freight train rambled through the Pine Barrens. One trip they had a newbie conductor on board. As he was working at his desk, he didn't notice Brakie grabbing the rifle out of his locker and ascending the ladder to the roof of the hack. Soon, shots rang out and Brakie descended to go grab his squirrel only to be met by a ghost white conductor who thought the train was being held up! I guess you had to be there but it was a cussing good time. Story goes the Brakie's squirrel stew - slow cooked over the coal stove - was THE BEST! Info: Bob "Ducky" Kaelin of Southold, NY He was a kid at the time and rode the hacks from Riverhead to Greenport with the many freight crews that came out this way. The Montauk freight went close to Indian owned property. The population of the reservation included a few Indians that were Gandy Dancers that first worked out of Hicksville and then later on out of Riverhead. I had the privilege to work with them when I was 16 years old. When I went into engine service it was a regular duty ,of mine, to call the men I knew, to tell them where we hit deer, after Amaganset. They always met the train on the way west to deliver steaks and roasts. I never got squirrel steaks.